PRESS RELEASE: Native Instruments today announced Traktor Kontrol S4, an integrated DJ system with state-of-the-art performance capabilities and intuitive tactile control. Based on ten years of digital DJing expertise, Traktor Kontrol S4 combines a special version of the Traktor Pro software with an advanced hardware controller, both developed in unison to give DJs of all genres unparalleled creative possibilities with supreme work flow and ease-of-use. Traktor Kontrol S4 represents a new level of software and hardware integration that makes DJing more versatile, more intuitive and more fun. The full-featured controller combines a four-channel mixer section with ergonomically laid-out high-quality control elements and an integrated audio interface, all designed to professional specifications. All relevant functions including looping, cueing, effects control and track browsing are immediately accessible on the robust and portable hardware, while dynamic multi-color backlighting, LED status displays and comprehensive level metering allow DJs to focus on their performance rather than on the computer screen. The included Traktor Pro S4 software offers the full feature set of Traktor Pro, further expanded through powerful new performance functions and an optimized user interface that offers superior usability under all conditions. Two flexible Sample Decks can add up to eight simultaneous one-shot samples or beat-synced loops to the mix, opening up creative remixing and mash-up possibilities that go far beyond conventional DJing techniques. The unique Loop Recorder also allows DJs to capture and overdub audio loops from the live mix, cue signal or an external input on the fly, and drop them back into the mix at any time. The dual touch-sensitive jog wheels on the Kontrol S4 hardware offer extremely precise and responsive deck control due to a new patentpending electromagnetic technology, complemented through Native Instruments' high resolution NHL protocol that provides superior performance over conventional MIDI. The integrated low-latency 24bit/96kHz audio interface is based on the acclaimed AUDIO 4 DJ, and provides professional signal quality to match the most high profile club systems. External time-code control via turntables and CD decks will be enabled through a future software upgrade. To accommodate touring DJs, a professional flightcase that doubles as an adjustable performance stand will also be available as an accessory for Traktor Kontrol S4. 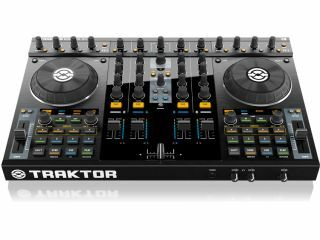 Traktor Kontrol S4 will be available this winter for a suggested retail price of $999 / 899 EUR. The Traktor Kontrol Case will be available at the same time for $189 / 169 EUR.